In 2007, around two million American homes were without cable or satellite television. A 2013 Nielsen study found that today more than five million homes have embraced an existence without traditional TV. But that doesn’t mean they’re staring at their four walls. More than three-quarters of these homes rely on the internet for their entertainment. If you’re ready to join them, just one question remains: Apple TV or Roku? In June 2013, Apple TV offered just 18 channels compared to more than 750 on the Roku box. In late 2013, Apple expanded its library with some more crowd-pleasing channels, including ABC, Crackle, and Bloomberg, but Roku users have been enjoying these for years. Roku now offers more than 1,200 channels on offer, but quantity doesn’t always equate to quality. Many users insist they only watch a small percentage of Roku’s offerings, so in actuality your viewing experience might not be too different. Roku is the clear winner when comparing the bare bones systems, but canny Apple fans have found ways to expand their viewing options. For example, many compare the price of a standard internet service with a FiOS bundle, which allows them to stream or download movies. If you’re going to spend money on additional entertainment, this package may end up being more cost effective. Roku’s extensive channel list could get unwieldy without its universal search. Tech bloggers have suggested Apple would do well to incorporate this feature, which allows users to search for the title of the movie or television program they’ve been dying to see. The Roku interface displays the installed apps that can show the content, and how much streaming will cost on each. It sounds like a small point, but if you’re one of the many people who enjoys binging on television while the rest of your household sleeps you’ll love the Roku’s headphone functionality. Its remote control has a headphone jack to make private viewing easy. Just pop in the included earbuds and you can watch your favorite shows without disturbing your loved ones. The quality of the earbuds isn’t outstanding, but audiophiles can easily use their own. Apple’s familiarity will give it an edge for many consumers discovering internet television for the first time. Its interface resembles Apple’s popular iOS system, with rectangular channel icons which resemble apps. It also integrates with iTunes so users can use their existing account to purchase television series and movies. It’s not that Roku is difficult to use, but it can’t capitalize on brand loyalty the way that Apple can. A 2013 study found 81 percent of Apple smartphone customers stuck with the iOS platform over a 12-month period, compared to 68 percent remaining loyal to Android. Another 2013 report by international brand consulting firm Interbrand ranked Apple as the world’s number one brand, ahead of Coca-Cola, Google, and IBM. When it comes to brand loyalty, Roku simply can’t compete. Apple appeals to the loyalty of its faithful followers with AirPlay, a feature which lets you wirelessly stream photos, music, and videos from your iOS device or iTunes to your television set. This innovative device also integrates with key third-party apps including Pandora and Spotify. To be fair, Roku has attempted to mimic AirPlay’s success with the release of its new Roku 3. This latest streaming set-top box features Play on Roku, which allows users to stream the photos, music, and video files stored on their favorite Android or iOS device. 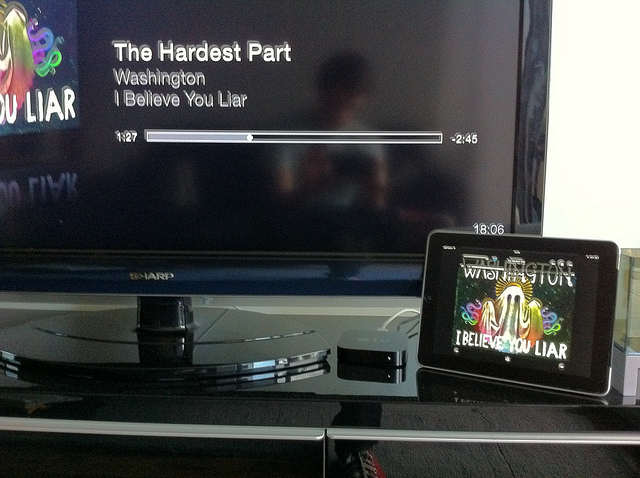 However, unlike AirPlay, Play on Roku doesn’t allow device mirroring, so it’s still got some way to go. Both units have comparable recommended retail prices, with Apple TV selling for $99 and Roku 3 costing $99.99. However, that doesn’t tell the whole story. Apple knows it can count on customer loyalty, so it rarely discounts its streaming television. In contrast, the latest Roku set-top streaming box is regularly sold online for around $10 less than its nearest rival. If you’re still not certain which unit is best, then the price could sway you. Apple TV and Roku both have their merits, so it’s worth thinking carefully before committing to your preferred device for streaming internet entertainment.